Both Dr. Moran and I have cerebral palsy. I teach and research in sport management. He teaches and researches in adapted physical education. Thus, Ability Olympics has turned into a natural event for us to plan. He has experience planning physical activities for people of all abilities, and I can make sure we market it, manage food, and address volunteer logistics. 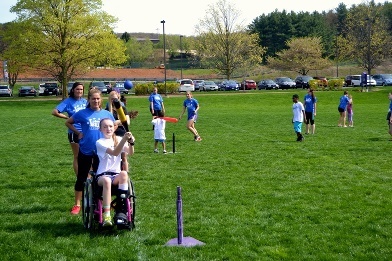 We hosted Ability Olympics last year at JMU and had 45 participants, which we considered a major victory. At this year’s event, more than 150 youth converged onto campus for the two-day, free event. Most participants had a disability. Some, however, did not. We encouraged participants who signed up to also bring a sibling or friend. The young athletes participated in 13 different sports that culminated with a closing ceremony speech by Lauren Darensbourg from the President’s Council on Fitness, Sports and Nutrition and each athlete awarded an Ability Olympics medal. Saturday, April 18 was a day of sport at Godwin Gym as the athletes took part in sports such as swimming, soccer, golf, gymnastics, tennis, and other events to both learn skills and showcase their abilities in front of their peers and parents. One highlight of the day was when the JMU men’s soccer team welcomed the athletes, participated in the opening ceremony, and then assisted with the soccer stations for the morning hours. More than 230 JMU students volunteered over the two-day event. The event was a success overall, but one lasting memory may haunt me forever. When I walked into Friday night’s social event, I immediately began talking with parents around the facility as they watched their son or daughter socialize with others and play games around the arena’s concourse. I simply introduced myself and thanked them for coming. The immediate response I received will not leave me. The first four families I spoke to each told me that, and it bothered me. Sure, it was an ego boost for Dr. Moran and me to know something is right about this event. But in the big picture, it comes down to this: There must be more of this. More sport. More events. More training. More time devoted to disability sport. More opportunities. More inclusion. There must be more. After the event concluded, Dr. Moran and I shared stories like these that we encountered and realized that a major challenge lies before us. We celebrated a successful weekend but knew that the bar has been raised higher. We all must do more. Join the JMU Adapted Sport movement on Twitter at @JMUAdaptedSport and on Facebook at James Madison Adapted Sport. The growth for this event has exploded. It looks as if activity is needed in rural areas of the state. Neighborhoods and schools are where the focus for physical activity needs to begin for people with disabilities. Exactly right regarding neighborhoods and schools. Perhaps that is what the Dear Colleague letter will ultimately provide, but for now it is on the shoulders of educators and community recreation leaders to harness their “Field of Dreams” approach: Build it and they will come.